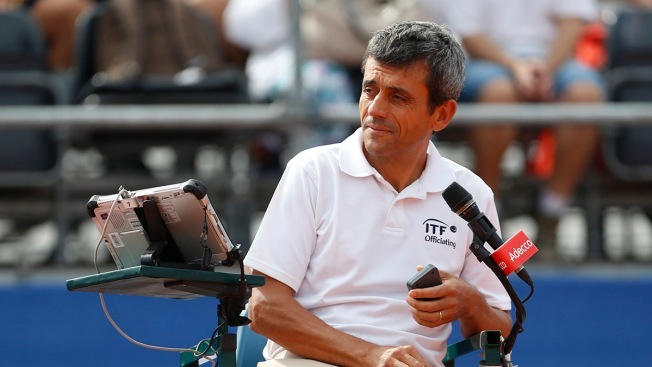 Tennis umpire Carlos Ramos gets ready to officiate the Frances Tiafoe of the United States, against Marin Cilic, in a Davis Cup semifinal singles match between Croatia and the United States in Zadar, Croatia, Friday, Sept. 14, 2018. The chair umpire who penalized Serena Williams in the U.S. Open final is pleased to be getting back to work. "I'm just focusing on this tie and working again. That's all I can say," Ramos told The Associated Press before the opening singles between Borna Coric and Steve Johnson, which he did not officiate. Ramos was directing the second singles between Marin Cilic and Frances Tiafoe.